After our guided tour of the Sydney Opera House, we broke tradition with all the tramping we had done and ate dessert for lunch at Guylian Belgian Chocolate Café near the opera house. We ordered slices of chocolate cheesecake and washed it down with hot chocolate while we people-watched on the outdoor patio. Now that we had packed on the calories, we again played tourist for the afternoon, sightseeing and shopping, adding to the Kathmandu bag we had purchased in Christchurch—a smart luggage addition certain to come in handy for future travels. Back at the Marriott, we changed for dinner at Tetsuya’s. The food and the service can be summed up in one word: exceptional. As for the ambience, it’s an architectural oasis in the heart of the city. 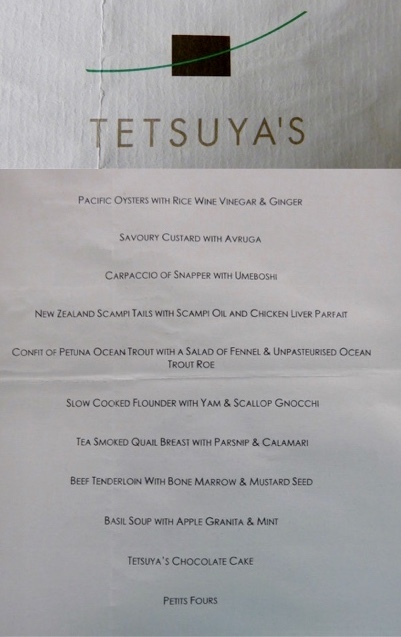 Please excuse the rumpled menu (shown at the end of this post). It didn’t survive the flight home as well as we did. 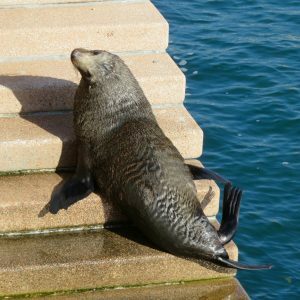 On our last morning in Sydney, we paid a visit to Sammie to say goodbye to the sea lion who had become a famous fixture on the dock steps near the opera house. From there, we walked to Dawes Point, the site of Australia’s first fortified position, constructed in 1788 to protect the cove from foreign invaders. All that remains of the former Dawes Point Battery, which was manned until 1916, are five cannons. The fort was removed during construction of Sydney Harbour Bridge, which passes above the park. The week before our scheduled departure from Sydney to the DFW International Airport, American Airlines had put into operation its first Airbus A380, and this would be our first flight on the transatlantic, long-reach jet. As we settled in for the seventeen-hour flight, I wondered why someone couldn’t bring back the Concorde, and of course speed it up for an even faster ride. This entry was posted in Australia, Settings, Travel, Writing and tagged Airbus A380, American Airlines, cheesecake, chocolates, Christchurch, Concorde, convict history, Dawes Point, Dawes Point Battery, DFW International Airport, Down Under, Federal Group, Guylian Belgian Chocolate Café, hot chocolate, Kathmandu, luggage, Ma Dwyer, menu, opera house, outdoor patio, River Derwent, Sammie, sea lion, Sydney Harbour Bridge, Sydney Opera House, Tetsuya's, The Henry Jones Art Hotel, tramping, waterfront on December 28, 2017 by admin.